Contact us for CD orders. 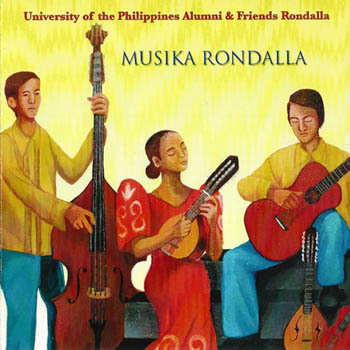 Musika Rondalla, a collection of thirteen katutubong atin (our very own) Filipino music, includes two immortal songs. The first is Ang Maya, a waltz composed in 1905 by Jose Estella, "Waltz King of the Philippines", for his zarzuela (a musical genre from Spain), Filipinas para los Filipinos. Inspired by the trilling bird song of the swift brown sparrow, it was said to be a veiled expression of the colonial Filipinos' yearning for freedom. The second is the art song Mutya ng Pasig written in 1926 by Nicanor Abelardo whose first musical instrument was the bandurria. Styled in the kumintang, the oldest Filipino song form and originally a war chant, the poignant lyrics were by Deogracias del Rosario, known as a Makata ng Puso (Poet of the Heart). Ano Kaya ang Kapalaran is considered a kundiman, from the Tagalog phrase kung hindi man -- were it not to be. The music and lyrics were written in 1939 by Francisco Santiago, affectionately named the "Father of the Kundiman Art Song". Also included is the beautiful love song Usahay, a slow waltz written in 1961 by Nitoy Gonzales, rondalla maestro and octavina player with the Bayanihan Dance Company. Bulaklakan, a polka, is a folk dance of floral garlands usually performed during the month of May. The lively music of another folk dance, Estudiantina, was derived from "Espana" by Isaac Albeniz. Tayo Na sa Antipolo written by the prewar singer and actor Jerry Brandy in 1929 is a paso-doble (meaning double step; a quick, light march). Antipolo is a pilgrimage site and a favorite summer destination. Ang Dalaga sa Bukid is a balitaw. The original balitaw is a pre-Hispanic love debate in song and dance from the Visayas. Another balitaw is Pamaypay ng Maynila by Constancio de Guzman, a music and composition student of Nicanor Abelardo. There are two more by de Guzman: Hinihintay Kita, a danza or serenade (harana in Pilipino) with the flavor of tango and the love duet Maalaala Mo Kaya, also a danza, written in 1940. Alitaptap and Lulay are folk songs. Lulay comes in several Philippine dialects. The most well-known is the Tagalog version telling of the hardships a man must endure for the love of a Philippine maiden. This CD offers features rarely heard Philippine songs and dances that were given fresh touch through masterful arrangements by music director Bayani Mendoza de Leon. Among these are Ang Mayang Malungkot (The Lonely Maya Bird), a soulful nearly forgotten counterpart to the more popular, lilting Ang Maya, both from Jose Estela’s zarzuela, “Filipinas Para Los Filipinos”, during the early American period; Pambungad, overture to Leon Ignacio’s “Alamat ng Nayon”, which was one of the most successful and beloved zarzuelas in the early 1900s and became a staple in the concert repertoire of Philippine symphonic bands and orchestras (the arrangement here is the rondalla debut of this lovely medley); Sa Lupang Sarili (In My Native Land), a deeply patriotic kundiman imbued with a sweet lullaby motif by Lucio San Pedro; Hatinggabi (Midnight), the immortal danza for violin by Philippine National Artist Antonio J. Molina; and two lively balitaws that celebrate the gifts of the land, Halina Sa Kabukiran (Let’s Go to the Meadows) and Masaganang Kabukiran (Bounteous Fields), the latter by Josefino Cenizal. Dances include Magallanes, Jota Batanguena, Jota Filipina, Pandanggo sa Tapis, Pandangguhan, and relatively little known Chotis, Haplit, and Tagala, all beautiful examples of the Filipino people’s assimilation of Spanish musical influences such as found in the jotas, fandangos, and boleros, through which their native identity has remained intact. 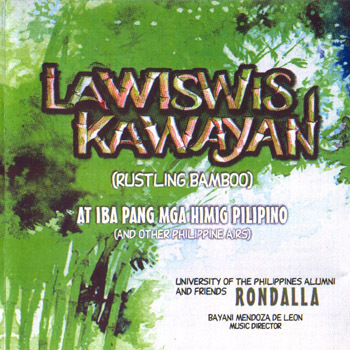 Closing the collection is the highly inventive and rousing arrangement of the folk song Lawiswis Kawayan (Rustling Bamboo) that perfectly showcases the versatility of the rondalla. Rondalla is the name given to the native string band of the Philippines consisting of various sizes of plectrum instruments that include the bandurria, piccolo bandurria, laud, octavina, mandola, guitarra, and bajo de unas (supplanted today by the regular double bass). Although it had its origin in Spain, the rondalla’s development, functions, repertoire,and instrumentation are distinctly Filipino. The Filipino people not only modified the appearance and acoustical design of the European models but also developed them to have a wider range, greater versatility, and more resonance. Historically, the rondalla figured prominently in Philippine community life, providing accompaniment to folk dancing, singing, and entertaining with solo pieces at various functions. A number of dedicated Filipino-Americans in both coasts, in particular, the University of the Philippines Alumni and Friends Rondalla, based in New Jersey, are rediscovering their musical heritage and are committed to preserving the rondalla as an integral part of this legacy. Numerous invitations have kept this widely acclaimed group busy performing all over New Jersey as well as out of state. 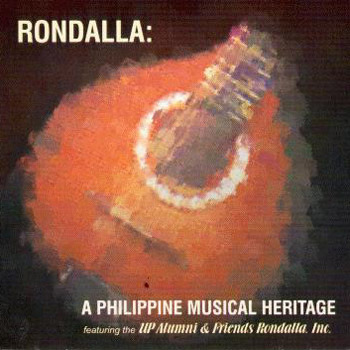 Rondalla: A Philippine Musical Heritage features the lilting cadence of folk songs from the different regions of the country, the poignant romanticism of the harana (serenade), and the melancholic passion of the kundiman (love song).